Primary tumors of the heart are uncommon. Metastases to the heart are more common, but rare overall (only about 5 to 10% of all malignancies have cardiac metastases). Seen over the surface of the epicardium are pale white-tan nodules of metastatic tumor. 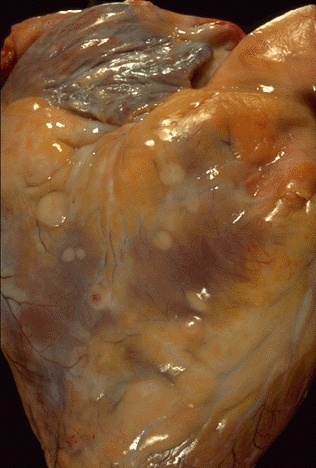 Metastases may lead to a hemorrhagic pericarditis.